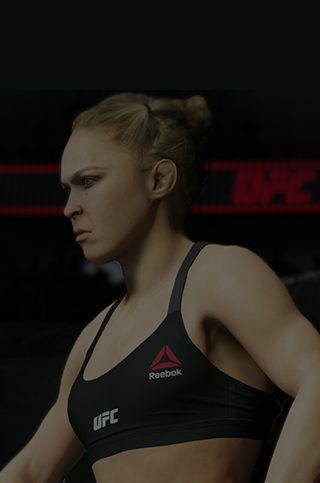 UFC 3 Gameplay Update #9 is here, with a focus on balancing grappling and striking. Long-awaited prospects Sean O’Malley and Israel Adesanya are here! Along with the new fighters in Content Update #9, Gameplay Update #9 brings several signature animations and some significant changes to the balance between grappling and striking. Let’s kick things off with Sean O’Malley’s signature animations. We were fortunate enough to have Sean O’Malley visit our development studio and participate in a full day of mocap recently. As a result, we were able to capture a wide variety of signature animations and some new techniques as performed by the fighter himself. In terms of animations, this update includes a full signature RPM (Real Player Motion) movement set for Sean O’Malley. In addition, he has a set of signature jabs and straights that only his fighter uses. The first is his signature 720 kick. You can perform this technique by pressing L1/LB + R1/RB and the rear uppercut button inputs. Aside from flash and style points, this kick offers the highest damage bleed through on block of any kick in the game at 0.5, and relatively low vulnerability compared to other kicks. The next signature kick is his 360 roundhouse kick. You can perform this technique by pressing L1/LB + R1/RB and the lead uppercut button inputs. This kick also offers a high degree of bleed through, a little less than the 720 kick though at 0.4. The 360 roundhouse has even lower vulnerability than the 720 kick. Finally, Sean O’Malley has his signature 360 guard pass animation that can be performed from the Feet On Hips position. The big benefit to the 360 guard pass is that it cannot be denied. To pull off the move, you’ll need to be at either neutral or positive Grapple Advantage. If you have the required Grapple Advantage, you can execute the move after any other move ends in Feet on Hips. For example, if you fake a transition left or right by tapping the stick, you can immediately perform the 360 guard pass by pressing the right stick left or right again after the cancel animation finishes. Alternatively, if you deny the bottom fighters transition you can immediately perform the 360 guard pass after the denial animation plays out. The ability to enter into the clinch has been a hot topic since the last content update, when the single collar clinch animation was changed. As a result of this feedback, we took a fresh look at clinch entries and denial windows and made quite a few changes. We’ve added dynamic clinch entry denial windows with this Content Update that scale with Grapple Advantage. This will allow players to better set up clinch attempts and will further punish players who fail to set up their clinch attempts properly. The following table shows the denial window frame counts given full negative, neutral, and full positive Grapple Advantage. In addition to the denial window tuning, we’ve added pre-emptive denial animations for both clinch and takedown denials. This will allow you to see if your opponent is pre-emptively denying clinch attempts so you can shoot for a takedown instead, or allow you to attempt a clinch if your opponent is pre-emptively denying a takedown. We’ve made several changes to make setting up Grapple Advantage on your opponent easier. First off, we fixed a bug that prevented Grapple Advantage from being acquired after landing a strike and putting your opponent into a hit reaction. With that bug fixed, setting up grappling attempts with strikes will be much more viable. We’ve also removed the high block penalty on Grapple Advantage after a successful block. This should make setting up grapple attempts off successfully blocked strikes more viable as well. Finally, we’ve added grapple advantage to any situation where you create an angle on your opponent by sidestepping their forward moving strikes. And, if that wasn’t enough, to give you even more options to set up grappling attempts, we’ve added the ability to quickly chain from lunges into both takedown and clinch attempts and added the ability to quickly chain clinch attempts from successful head movement (ducks and slips towards the back leg). In order to balance out these changes, we’ve also made corresponding changes to the defensive side of grappling. We’ve added the ability to better defend against clinch attempts using basic standup mechanics. You can now use basic footwork to avoid clinch attempts, which reduces the effective range of clinch attempts and makes it harder to clinch someone who is retreating. In addition, we’ve tuned all the registration windows in the clinch attempt animations to allow strikes and clinch attempts to exchange more often. This essentially reduces the stopping power of clinch attempts versus strikes, which was often too high and resulted in unrealistic outcomes. There are two tuning changes to the ground game that will be important to understand once the fight leaves the feet. The first change adds a new per position, DOM/SUB permanent stamina tax on denial. This allows us to tune how much permanent stamina is drained on denial in different scenarios, giving further benefit to holding dominant position outside of ground and pound or submission opportunities. The following table outlines the new stamina modifiers. Finally, we’ve added some depth to the strike selection in top back mount. As of this content update, the hammer fist from top back mount will now to the least amount of damage of all the strikes available from that position but will be the hardest to trap. The hook will be the next most damaging but will be slightly easier to trap. Finally, the double hook will be the most damaging but will be the easiest strike to trap. Two changes that will change the effectiveness of body kicks are worth describing, too. First off, in order to make catch kicks more effective as a deterrent to throwing predictable body kicks, we’ve made two significant changes. If the catch kick strike to the head is blocked, it will now do long-term block damage. We’ve also proportionally increased the amount of bleed through on long-term head damage off the blocked strike. Also, we’ve added a long-term stamina drain and body damage off the trip that leaves the dominant fighter standing. Prior to this change, the option to sweep the leg didn’t serve much purpose. The hope is that with this change, players will have to start considering the low block option and will strengthen the effect of the catch kick and a punish. And secondly, we’ve tuned the range-based damage falloff for roundhouse kicks, making kicks thrown from close range do even less damage than before. And, we heard a lot of feedback that the Zabit trip was too difficult to defend. Along with the changes to clinch attempts that will make it possible to evade the Zabit trip with footwork, we made a change to allow you to defend the Zabit trip with both clinch denials and takedown denials. We will continue to monitor feedback, but we hope this change is enough to balance out that move. - Fixed a bug with the front kick to the head converting to a roundhouse instead of a knee at close range. We hope you enjoy the changes, and please keep the feedback coming! Don't forget to check out all the additions to the roster with Content Update #9.